'Just' a shot of our little ski area from the parking lot looking towards the lodges and the mountain. There aren't many folks are here yet - patrol and a few lodge people only - and no public. It's a peaceful time. I thought this shot captures this mellow early-morning vibe well. 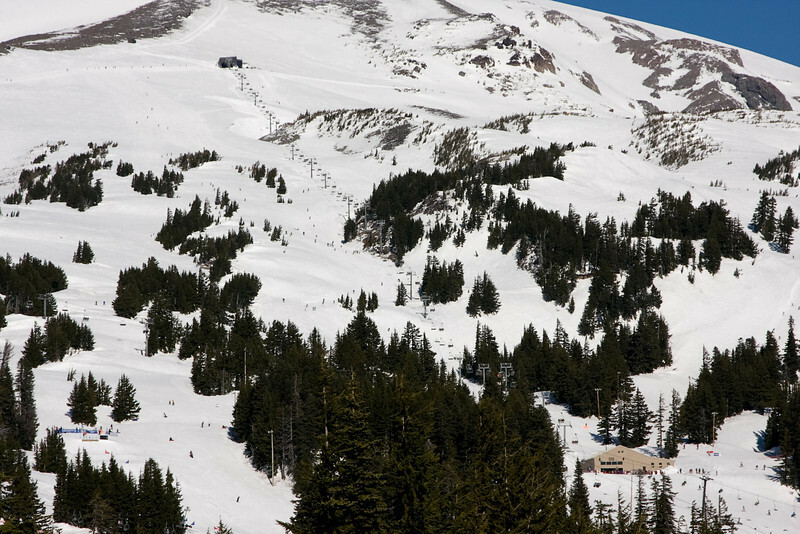 For those not familiar with Meadows, you're only seeing about 2/5ths of the skiable terrain the resort encompasses. This is a 9-shot panorama stitched together in Photoshop CS3. 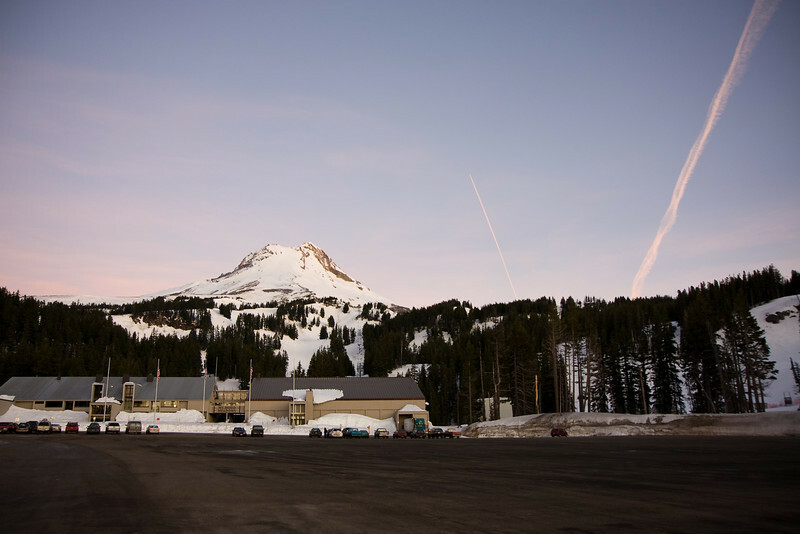 Nearly anyone that has been around Meadows for a while knows to avoid skiing or riding on weekends - the place can get packed. Often on these days I go for a snowshoe hike out to the powerline and back (about an hour round-trip), which is just perfect after a morning of grooming. This shot was taken from a high spot along my snowshoe route looking back towards the Cascade Express lift and Meadows' "upper mountain" area. While perhaps not elbow-to-elbow people, it's definitely too crowded for me. This was very much an ordinary and low-key morning otherwise, but I thought this subdued view from the top of Daisy Bowl nice. Such cloud layers are very common in this region - 'like an ocean', is a frequently heard analogy. 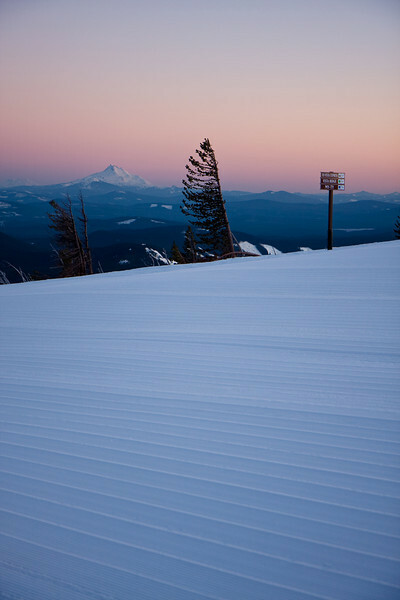 Nicely-matched corduroy and calm weather greeted the morning sun in February a couple years ago. This is Lower Texas Trails. I'm particularly impressed with the lack of flare in this shot - the 17-40mm f4.0 lens I had then was noticeably better at resisting flare than my current 17-55mm f2.8 IS. 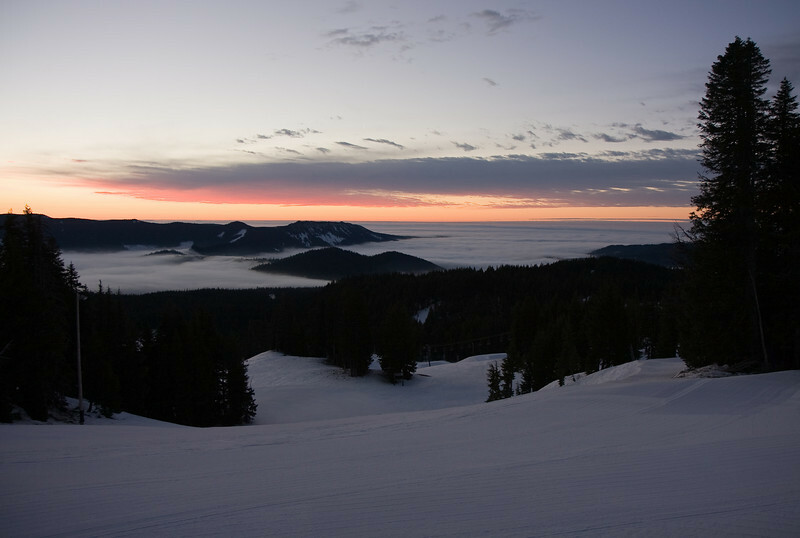 The Cascade mountains are notorious for their severe weather. 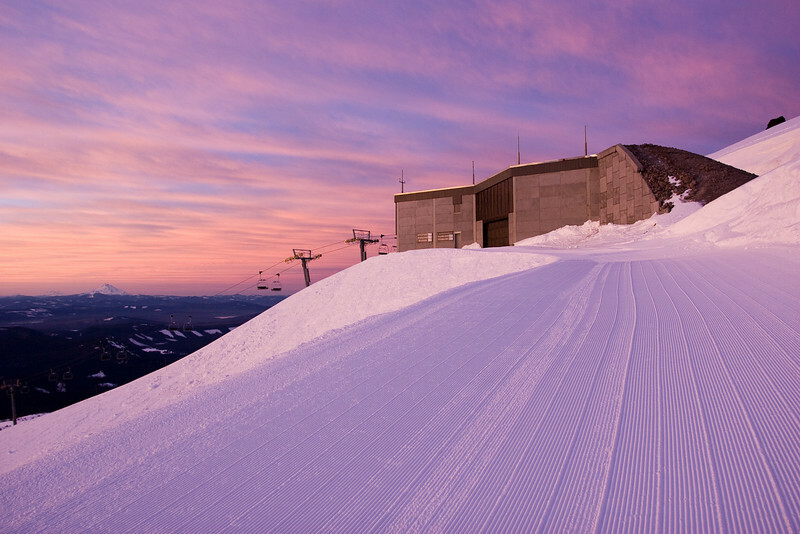 A number of Cascade ski resorts have built their upper alpine-terrain lifts inside of buildings to protect them from the hurricane-force winds and high snow loads found here. This is Meadows' Cascade Express lift. This vantage point is good for sunrises. This one had a decidedly purple-cast to it. 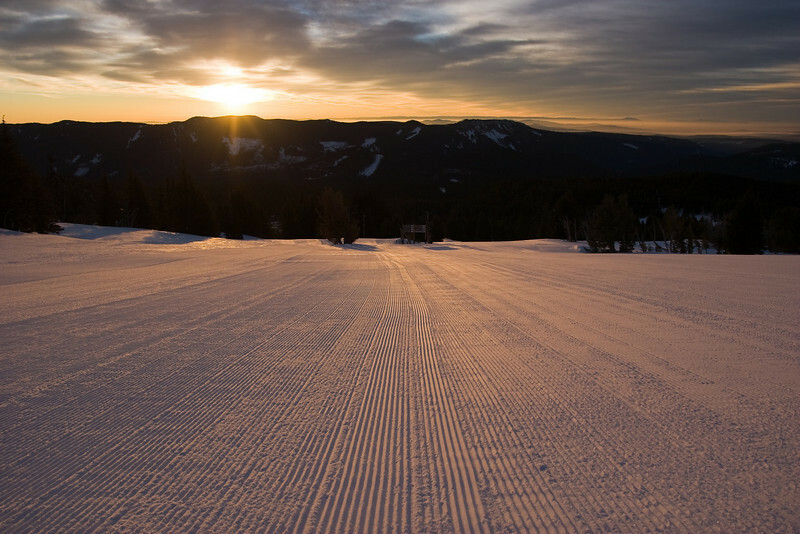 If there's one thing that's guaranteed to stop a snowcat, it's a groomer with a camera being shown a lovely sunrise. This was the very first shot I took with my then-new 40D and 17-55 f2.8 IS lens. I was quite impressed, if you can't tell - it has proven to be an extremely sharp lens! The only drawback that I've found with it is its proneness to flare. For the last two weeks of this ski season, I've been on swing shift (4pm-midnight) rather than my normal graveyard shift. Though not my favorite work shift for a number of reasons, it has allowed me to enjoy the evening light and sunsets, which have been a nice change of pace. 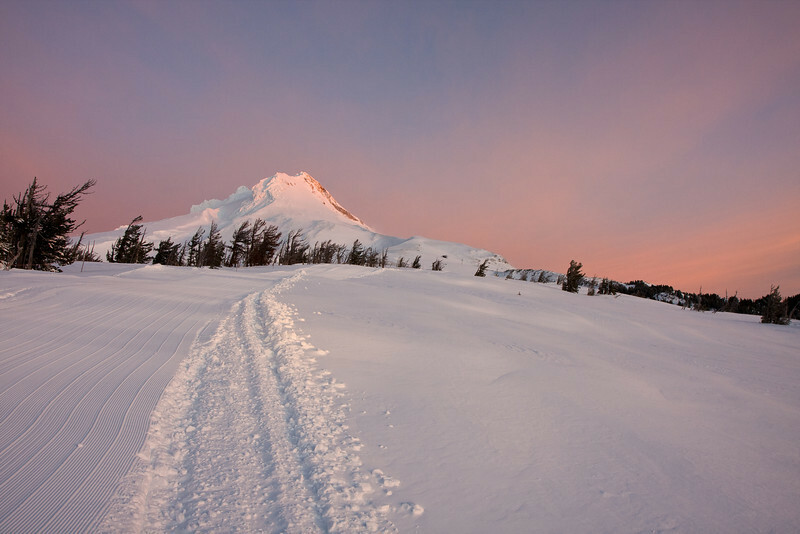 This shot was taken in the Vista Express area of Meadows at the top of the run called Lower My-Ty. I found the nicely-matched corduroy flowing by at an angle made for an attractive foreground for the sign, white-bark pine tree and Mt. Jefferson behind.